A year ago we tested AB-Com's IPBox 250S, one of the most affordable Linux-based satellite PVRs – which can be considered an inexpensive Dreambox alternative. As with the Dreambox, the 250S benefits from the third-party ﬁrmware support that its operating-system encourages. Now we have the IPBox 9000HD, which also runs under Linux. The spec (and price!) is greatly expanded relative to the 250S. You get two tuners, plus full hi-def (DVBS-2) compatibility. Interestingly, we're still awaiting its Dreambox equivalent. UK distributor Satellite Superstore also sells plug-in DVB-T (digital terrestrial) and DVB-C (cable) tuners (not compatible with Vision Media) for £60 each. You can replace one or both of the satellite tuners with these, giving rise to interesting possibilities. Satellite Superstore sells the 9000HD pre-conﬁgured with a generous 500GB SATA HDD and the default software installed. Installing third-party firmwares from the internet also gives you CAM emulation using its card slots. The front panel is dominated by an alphanumeric ﬂuorescent display showing status information and channel names. A smart but ﬂimsy full-width drawbridge lowers to reveal operating controls made of rather tacky chrome-plated plastic. In addition to volume and channel change, full menu-access without the remote – a fully featured affair capable of operating many TV sets but spoilt by tiny buttons – is possible. Unusually, you get a handy 'ﬁle' button that brings up the recording list. In its lowered state, a pair of CI slots are also visible. On top of this are the two aforementioned card slots. On a receiver of this sophistication you expect USB connectivity – and it's present, albeit only on the rear panel. There are two USB sockets – a host (for memory devices and external HDDs) and a client (enabling the 9000HD to be recognised by a PC – a deﬁnite plus for the transfer of recordings). The client port is intended for multimedia playback and ﬁrmware upgrades. Other data connectivity includes the all-important 10/100Mb/s Ethernet port, an old-fashioned RS232 serial port and – unusually – a jack for the built-in modem. The tuners are independently connected, two sets of IF inputs and outputs being present. Although the output of one can drive the other's input, you'll need to buy or make your own loopthrough cable because one isn't supplied. Ideally, both tuners should be fed from a dual-LNB – that way, they'll be able to simultaneously receive channels of different band and polarity. It's also possible to feed each input from an independent dish or multi-feed setup (DiSEqC 1.0 is supported). As far as motorised dishes are concerned, the receiver is compatible with DiSEqC 1.2 and USALS protocols. The rear-mounted TV Scart caters for composite and RGB – its VCR counterpart located just above, supports only composite video. There's also a component output and an HDMI port. Both are capable of going all the way to 1080i for hi-def and upscaled standard-def alike. Also on offer are composite and S-video, stereo analogue sound and Dolby Digital-ready optical digital audio outputs. No UHF modulator is on board, which is a pity. The System Setup menu deals with parameters like languages, time, parental locks, wake-up timer and banner time-out periods. A further Advanced settings menu covers networking (DHCP is supported, for automatic conﬁguration) and HDD formatting. It also looks after timeshift buzzer size, timer start/ﬁnish delays and even HDD cooling fan activity. In Service Searching you'll ﬁnd the LNB/dish/tuner conﬁguration settings and channel scans. Also here reside the motorised dish options, separate menus being provided for DiSEqC 1.2 and USALS/DiSEqC 1.3. The DiSEqC facilities are easy to work with and compatible with the various motors and positioners we tried. The dish can be moved continuously or in steps, allowing you to peak the dish while monitoring the bargraphs that indicate the signal strength and quality of the currently selected transponder. As soon as the optimum position has been found, it can be stored. Multi-satellite searching is included – the 9000HD will automatically move from one satellite to the next. However, as with so many other receivers, scanning tends to start while the dish is still in transit. In addition to the usual automatic channel search – for which you can specify free and/or encrypted channels and network-seeking – is its manual counterpart, which lets you specify a transponder for searches. Here, polarisation, frequency and symbol rate can all be entered – while a submenu facilitates PID entry. Regrettably, you don't get the hardware blind search of the competing Vantage HD 8000S. Which brings us to the most important beneﬁt of Linux-based receivers. Their open-source nature encourages the development of third-party ﬁrmware and plug-ins. Thanks to the Ethernet port, ﬁrmwares can be transferred directly to the receiver via the internet. Unfortunately, the official site (the modiﬁable FTP details of which are pre-programmed into the ﬁrmware) repeatedly failed to download the latest version, causing the receiver's display to ﬂash 'panic'. We found it easier to install new ﬁrmware via a USB memory device. The receiver's channel list can be sorted alphabetically, according to encryption status or by satellite. If you're feeding each tuner with independent dishes aimed at different satellites you can swap between the relevant channel lists. The manual says frequently viewed channels can be placed into one of ﬁve favourites lists. Our review sample receiver contained 25 such lists, so additional lists can be deﬁned. They're shared between radio and TV channels. Channel databases can be loaded or backed up over the network, courtesy of a Windows channel-editor program available from the internet. The receiver's integral channel editor has all of the expected features including delete, lock and rename. 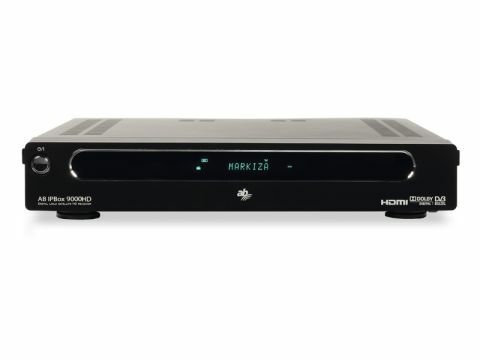 This receiver will do everything expected of a twin-tuner satellite PVR – including picture-in-picture, teletext and the 'bookmarking' of recordings. You can record and watch different channels, or play a ﬁle over the HDD while two recordings are in progress – an alternative to playing an existing recording is watching a third channel that shares a transponder with one of the channels currently being recorded. However, playing a current recording from the beginning is not possible – you can see it in the recordings list, but that's about it. The 9000HD's EPG supports both now-and-next and seven-day schedules, has both list and grid modes, and can directly schedule timer events ('reservations'). The timer in question can also be manually programmed, supports a seemingly unlimited number of events and allows for dates as far ahead as 2023. Recordings can be accessed from the Multimedia menu – there's also a handset shortcut key. Timeshifting, with trick functions is supported. Here, temporary HDD ﬁles provide the necessary timeshift buffering. The 9000HD can be configured to play MP3 audio ﬁles stored in the shared folders of Windows PCs on your network – although the (straightforward) process is, like much else, inadequately described in the awful manual. We tried transferring video ﬁles to the 9000HD's media/TV directory via FTP, but although transfer was successful, playback wasn't. The transferred ﬁles were not displayed in the recordings menu, not even digital broadcast-derived MPEG-2 transport streams, renamed with the 9000HD's .trp extension. However, it's possible to view JPEG photos, as well as play MP3 ﬁles – whether directly from a USB memory device or copied to the receiver's HDD from USB or a PC via FTP. The web interface, accessed by entering the receiver's IP address into the browser of a computer on the same network, is pretty but lacks functionality. The only things you can do are check mounted folders (including network shares), monitor HDD usage, change passwords, swap between menu skins or manage plug-ins. Plugging the 9000HD into a PC's USB slot and attempting ﬁle transfer thay way was successful, yielding a prompt for a 'Gadget' serial driver. No such driver could be found online. Searching was not particularly reliable, and we often had to manually seek out channels. No matter what we tried, ITV HD could not be received by the 9000HD. Another annoyance is that the signal strength and quality meters are close to useless. Even weaker channels that drop out register 99 per cent signal quality! Searches aren't the fastest either, as our results show. This isn't a problem with the multi-satellite search, as the receiver can be started off while you go off and do something else. An automated 12-satellite search spanning 8°W to 28.2°E took over 40 minutes. Bizarrely, subtitles are always displayed by default. The manufacturer will ﬁx it in a future ﬁrmware release. For now, Satellite Superstore recommends setting the subtitle language to 'Russian'. We found that the 9000HD is too eager to move motorised dishes during setup and channel selection, and this needs to be addressed. Other criticisms include long start-up times and a tendency to overshoot when changing channel. Sometimes you get just a blank screen after selecting a channel from the channel list. Going up a channel and then back down again usually gets your desired channel. On the plus side, picture and sound quality are excellent; BBC HD and Arte HD are sublime. Standard-def pictures fare well and it's hard to fault the receiver's upscaling, which is up to the standard of a good budget DVD player .